Hair wrapped artfully in a turban of black cloth, her tough frame is softened by a lilac top and short frilly skirt. As she saunters in and out of the room, I watch the light momentarily catch on her earrings – they are two silver crescents, raw and slightly tarnished, sweeping around a hollow in the shape of the full moon. She is the matron of our guesthouse at the top of the hill, beside Viewpoint No. 3. She hands me a small teacup, filled with a clear, slightly yellow liquid dotted with tiny grains of rice. The matron watches intently as I slowly take a sip. It holds a powerful flavour, reminiscent of countless family dinners at Chinese New Year and steaming bowls of tongyuen – little balls of glutinous rice flour stuffed with sugar and sesame paste. The wine is silky-smooth and refreshingly cold, tickling my palate with the fragrant, floral sweetness of a light dessert. I nod approvingly, smile, and ask for two glasses. 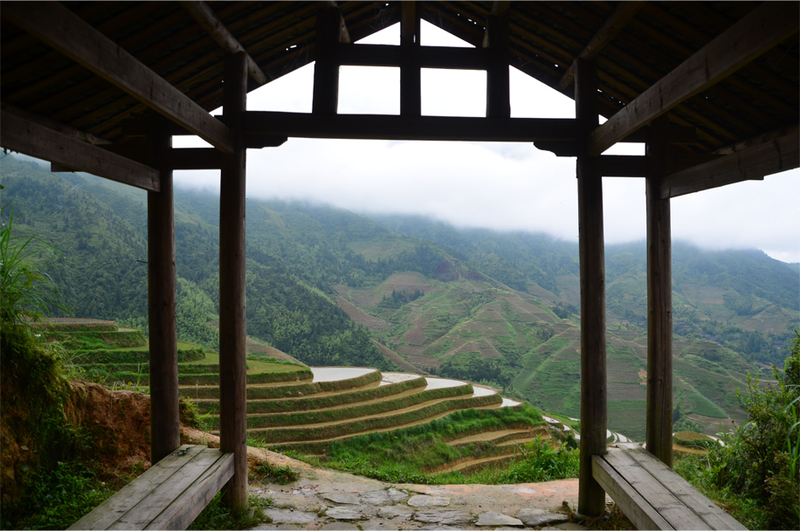 Our visit to the Longji Rice Terraces was only meant to be a day trip, but when we told the hostel staff in Xingping of our plans, they reacted in wide-eyed shock. “No, you must stay overnight!” Maya exclaimed. “On a day trip you can only see it for a few hours. 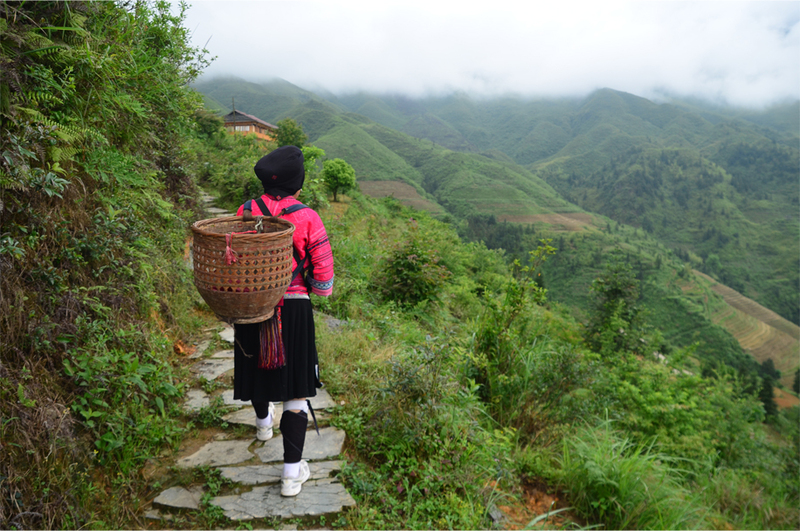 Are you staying with us in Guilin?” When we said ‘yes’, she paused, casting a wistful sideways glance. “Although it’s not good for our hostel… we really recommend spending more time up there. Let us know and we’ll help you cancel your booking.” Soon enough she returned with a set of directions scribbled on a torn piece of paper, in English and immaculate Chinese characters. Long before we arrived the villagers had been waiting for prospective customers to show up at the car park. Once out of the van we find ourselves mobbed – caught up in a blur of bright pink, black and glittering jewelry. My level-headed companion, Bama, seems more than a little overwhelmed by all the commotion. With a gentle grin a young woman in full costume hands me her business card. On closer inspection the card is well put-together, with a photo of an attractive three-tiered dwelling perched on the crest of a misty slope. “How much is a room?” I ask her. It’s an easy transaction. There is no need for bargaining, and from her side there is no attempt to demand a hidden surcharge, unlike the opportunists at the bus station in Guilin. 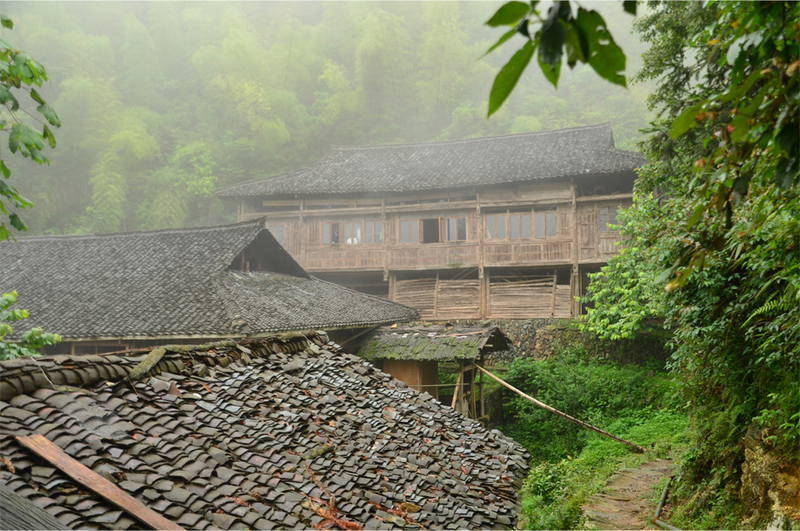 It’s a 40-minute hike from the entrance gate, up a twisting gravel road and past a series of weathered diaojiaolou. 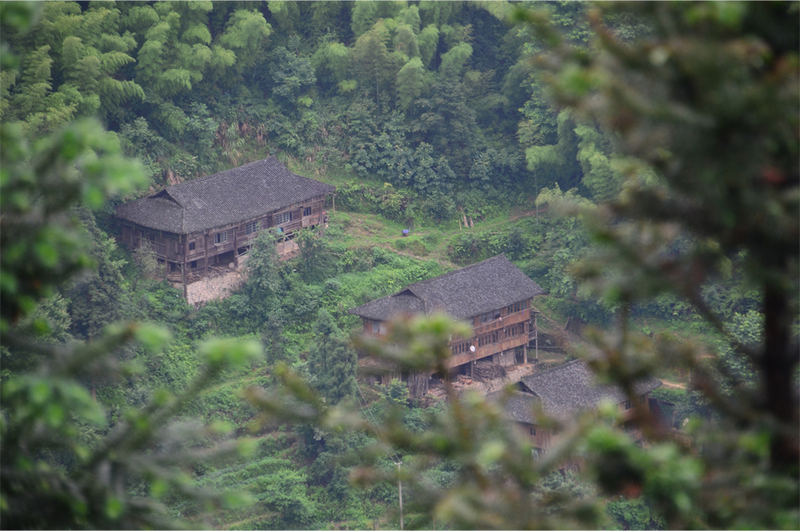 Previously we had spotted these “hanging houses” on the way in from Guilin, clinging to the terraced slopes, curling wisps of smoke rising amid the tumbling cascades of grey tile. 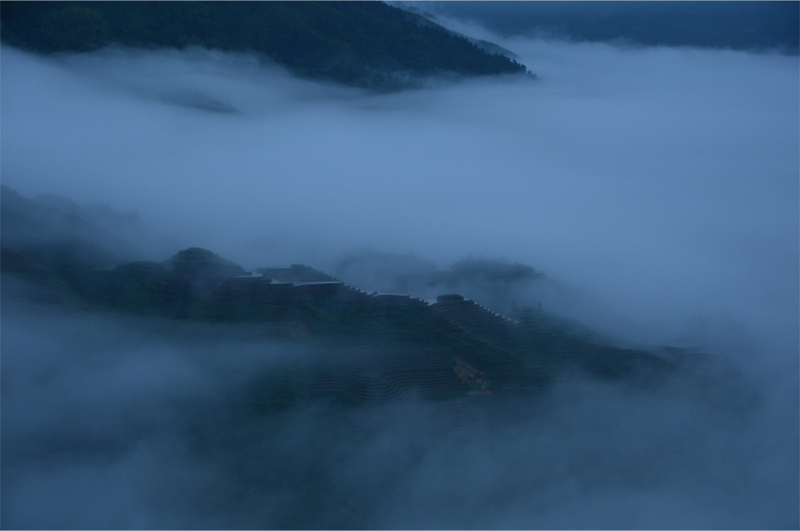 A second Yao porter, perhaps in her early forties, motions us to carry on, up the hill and into a thick patch of fog. We are accompanied by the sound of water rushing from the mountaintop, rising from the hand-dug channels lining the pathway. Beneath our shoes the thin slabs of shale glisten like obsidian in the drizzling rain. “Ng ng!” Our Yao porter flares her nostrils, eyes almost piercing with a dash of mischief. This is the Yao way, she tells us, of saying hello. 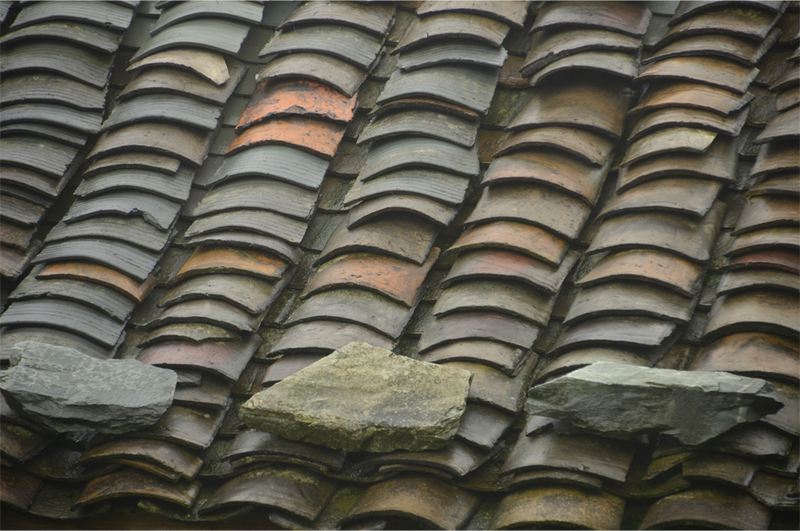 With its wood-patterned windows, rough-cut columns and tiled roof, our guesthouse is just the sort of accommodation we’ve been looking for. It’s basic but cozy, equipped with the sanitation facilities you’d expect of a rural Chinese inn. The unassuming owner of this family-run guesthouse, Ms. Pan’s husband, is both the general manager and the only cook. He is the one who takes our order before disappearing into the kitchen doorway. We wait in patience, intrigued by the noises emanating from the kitchen. Every now and again the chopping is punctuated by the sound of crackling flames, an orange glow reflected in the nearest window. At a large round table in the corner a band of merrymakers can barely contain themselves over cards and cans of beer; four other members are poised to begin a new game of mahjong. I strain my ears to hear the comforting swish of mahjong tiles being “washed” on a vinyl tablecloth. But the game is interrupted by a sudden gasp as our fellow diners clamour for the front door, scrambling towards the concrete platform that abuts the guesthouse. At last light the mist has finally lifted from the valley, and the rice terraces emerge in a momentary period of clarity before fading back into the clouds. In Yao the term for ‘thank you’ – “nuo vi” – seems to mirror the intonations of my grandparents’ Shanghainese. So does “zang ka di va”, which is the phrase used to express one’s hunger. This is our state for the next hour or so, until the table is weighed down with copious quantities of rice, thinly sliced squash and chunks of chicken on the bone – stir-fried with vinegar, ginger and soy sauce. We have a harder time prying the meat from the plate of sautéed frog, all unfamiliar fragments with small bones and crispy sheets of skin. Halfway through dinner the entire guesthouse is plunged into darkness. Bama chuckles. “My friends – they can’t understand why I wouldn’t choose to go somewhere more comfortable.” We sit in blackened silence, listening to the rain drumming against the wooden walls and window panes. With a shout the corner table continues their jamboree by the light of their mobile phones. The next morning we descend the stairs to a breakfast prepared by the manager and chef extraordinaire. He serves up two identical stainless steel bowls, filled with rice vermicelli and a generous portion of egg in a peppery tomato broth. With less than two hours until our departure, the fog blanket evaporates, exposing wave after wave of paddy fields carpeting the rugged landscape. I love how you tell the story James! This part of China was the least crowded during our trip. I wonder how much the cable car system would alter the entire village. If there must be a change, I hope it’s going to be a good one. By the way your second photo is just amazing! Thank you Bama! It took a long time to get this written up, but now I’m quite happy with the narrative. Despite the weather I think we were really lucky to see the fog lifting at the very last minute! I love your shot of the rice paddies from above. I’ve never seen one quite like it. As usual – sounds like a fabulous trip! Thanks Terri! Apparently we arrived just after the season’s harvest – too late to see the plants fully grown, but in time to witness the paddies being topped up with water! Great – an excuse to go back! i love the citadel! incredible moment. 🙂 thanks for this share, i could say im in a virtual trip to china now. Lovely James! Reminded me of oldish lady with the rattan basket who carried my heavy suitcase from the entrance all the way to my room which was on the top floor. And there is no lift and the road is really steep and steps huge! I felt so bad I gave her a huge tips. Are you planing to see the Boulder Canyon? I think its not far from the Merryland Resort. I too felt incredibly guilty when I had my suitcase carried up the mountain – and by a 60-70 year old! We didn’t get to visit the Boulder Canyon while we were in the area, from the sound of it I would have to try my hand at rockclimbing before making it there! James, what a beautiful hike and tale. The rice terraces and the misty images are simply spectacular. I would love to hike in this place someday. Thank you Marisol – it was not at all a difficult hike but I think the cool weather probably made it much easier. Definitely one area to visit before it gets too crowded! Enchanting as usual. Wonderful and misty pictures of a fantastic landscape. I would love to go back and see it in a different season; we were told that autumn is the best time as all the paddies turn a spectacular shade of yellow. Gorgeous photos of a gorgeous place. Did you know that you and I were side by side in the list of WordPress’s recommended travel blogs the other day? I had no idea Debra! Did they do a special post on travel blogs? I’ll have to look it up! If you go to “Recommended Blogs” and look for travel you will see the WordPress selection. We are not there just now, but keep an eye on it and you may reappear. Third Eye Mom is there now. The Unwitting Traveller is there sometimes. One of my followers put me onto it a couple of weeks ago. Thanks Debra – I wouldn’t have noticed if you hadn’t pointed it out! It seems like a lottery of selected blogs, refreshing it a few times brings up Bagni di Lucca and a few others. Wow! 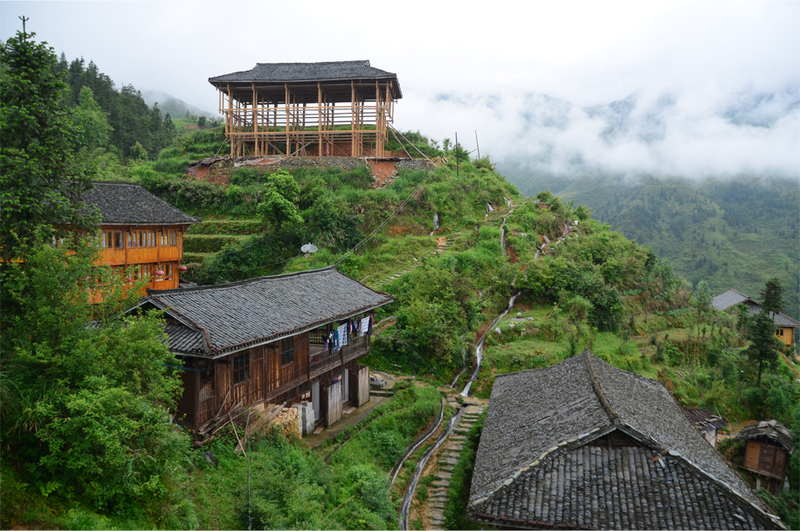 Longji looks absolutely magical. I love stumbling onto a place at the right time in history, as you did here. I’ve felt that way on the more secluded Southeast Asian islands and mountains, and in Myanmar. By the time I get to Longji, however, I’ll be taking that cable car! 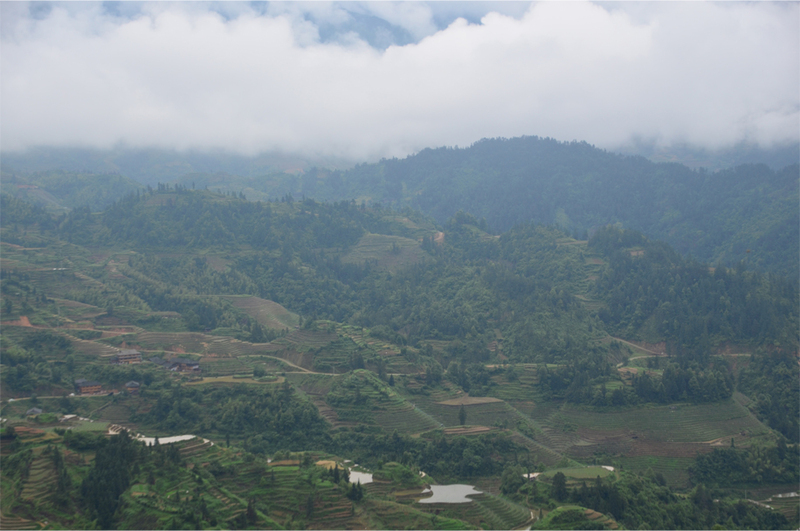 Apparently we managed to miss one of the main villages while at Longji – an email from a fellow traveller later on told us of his difficulty finding a room and the crowds of domestic tourists in that village! Myanmar is high up there on my wishlist and I came close to planning a trip there next April… until I realised it was the hottest month of the year! 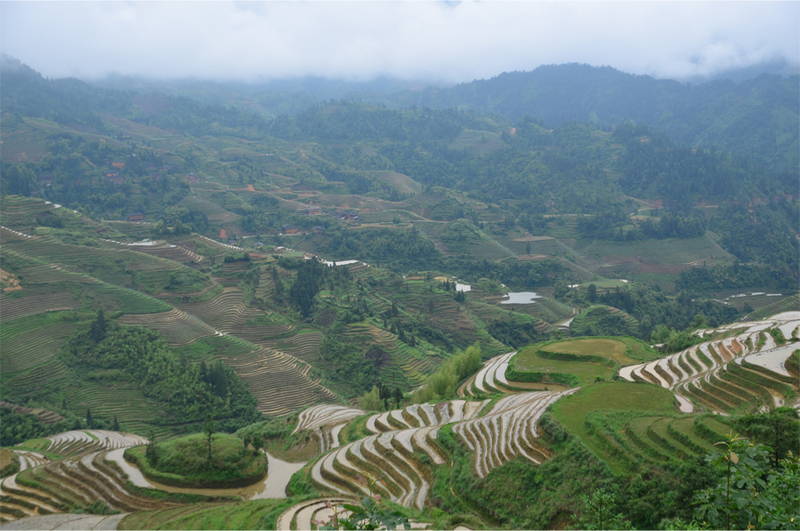 I was a bit worried about the mist when we arrived – it’s a good thing we stayed overnight otherwise we might not even have seen those terraces at all! It was a real treat to stay in that mountain guesthouse. But with the cable car being built I’m slightly wary about going back in the future… a view is so much better when you have to earn it on your own two feet! Wow! It looks like a dream. Take me there now, please. The mist added a lot of ambience – we were disappointed at the beginning, but when it lifted the valley didn’t quite have that same mystical feel! WOW! Congrats on being Freshly Pressed! Kinda neat to see someone I follow get this! I am just wondering why it took them so long to find you! Stunning images as always! Thanks a lot! I think being Freshly Pressed is a bit like winning the lottery – I must have posted this at just the right time and in just the right place! Gorgeous photos, as well as vividly picturesque writing (and makes me reminiscent of a Machu Picchu trip I took a few year ago). Machu Picchu is one of my dream destinations – I’ll have to start saving up for a 3-month trip across South America someday. Thanks for reading! Inspiring photos and write up. Makes me want to go. Let’s hope the cable car doesn’t spoil it. I for one would still want to walk. Great post! Beautiful pictures! You described the place very well. I was there last September, but only for a day trip. You made me wish I had stayed overnight. I was very surprised to hear about the cable car. The place might loose some of its magic… and will most likely become a tourist trap. Sad. Thanks Kina! 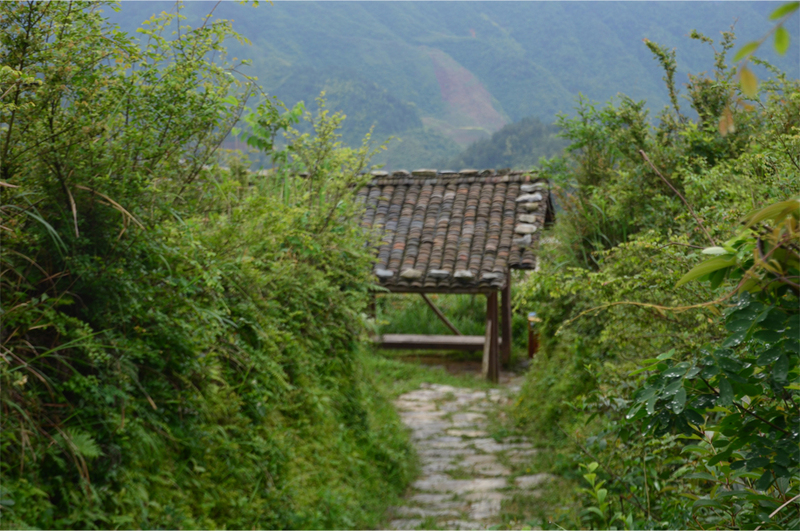 We were meant to visit the village of Dazhai but somehow we managed to avoid it altogether. It was a real blessing in disguise – later on we got word that the village was already packed with tourists. Unfortunately that seems to be the general trend with some of China’s most beautiful places… once it gets on the public radar the tour buses begin to arrive, followed by stalls selling all manner of knickknacks and then a cable car. I just hope the local Yao will maintain their friendliness and integrity in the face of all these pressures. I’ve shared your bog. It’s beautifully designed, nicely tagged, and the photography is outstanding! Well done. Beautiful words and beautiful pictures, an inspiration! Thank you! You’re welcome – thanks in turn for dropping by! Lovely! I went here last winter but it was FREEZING and none of the terraces were flooded. No fog either 😦 looks like you hit the jackpot when you went! That’s a great shot you’ve got there – the HDR really heightens the mood! 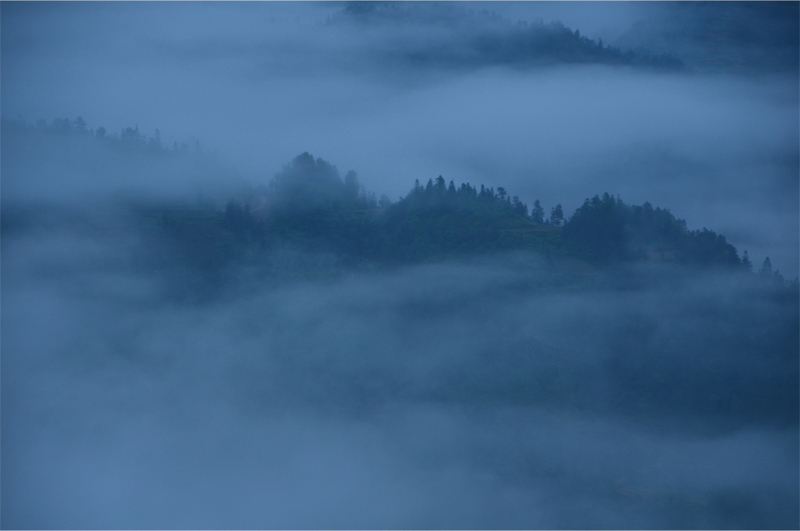 I remember standing at that exact spot, but the mist was still in the valley so we couldn’t see very far. These images are breath taking!! Always have loved looking at pictures of the rice fields.. Such beautiful photos! Sounds like it was an amazing trip. It really was Nicolle, I’d recommend it to just about everyone! Really appreciate it Alisa, thanks for the comment! Lovely. What a great way to see the countryside. It was so peaceful and refreshing – a real break from the madness of the nearby cities. 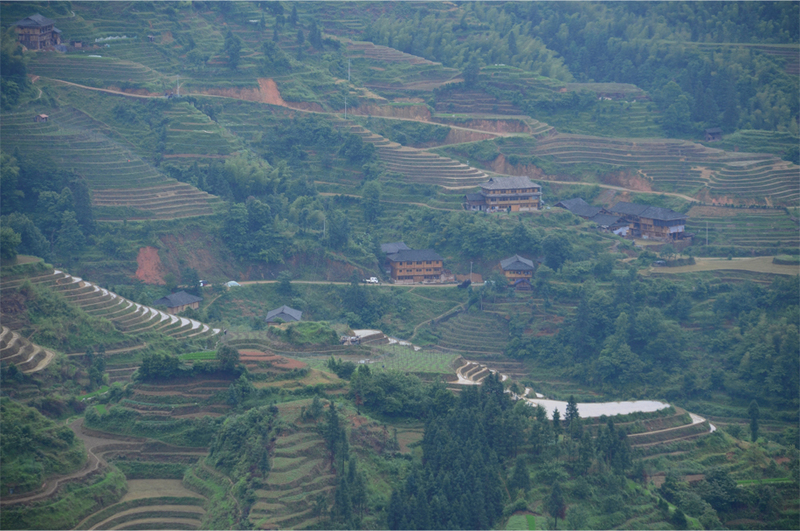 The Longji Rice Terraces in Guilin, Guangxi, China, are a place you must see up close to believe. I’m not a great fan of reading myself so the article’s not for me but I just stumbled upon your blog and wanted to say how stunning the photos are, particularly the rice paddies look incredible! Thank you – they were even better in person! It was Katie, and definitely worth more than a day trip! That sounds like such an amazing experience! 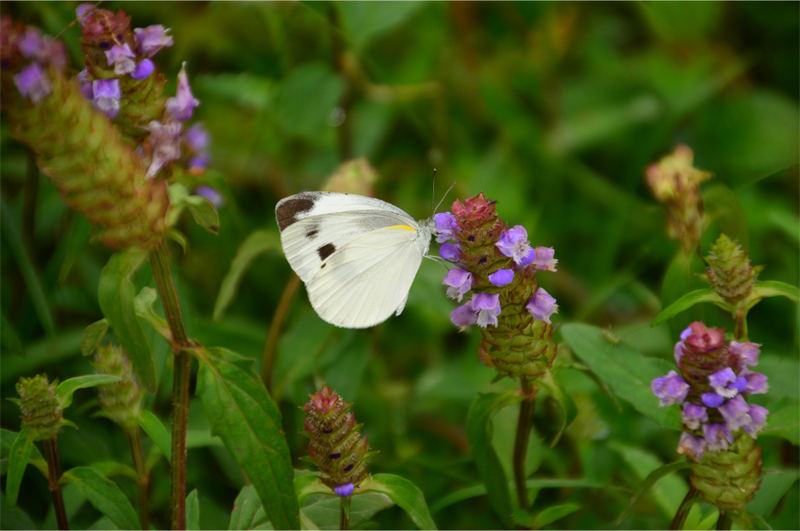 Great stories, and great photographs, Thank you for sharing! I enjoy reading others traveling experience to the most exotic places, I’d love to travel someday myself. 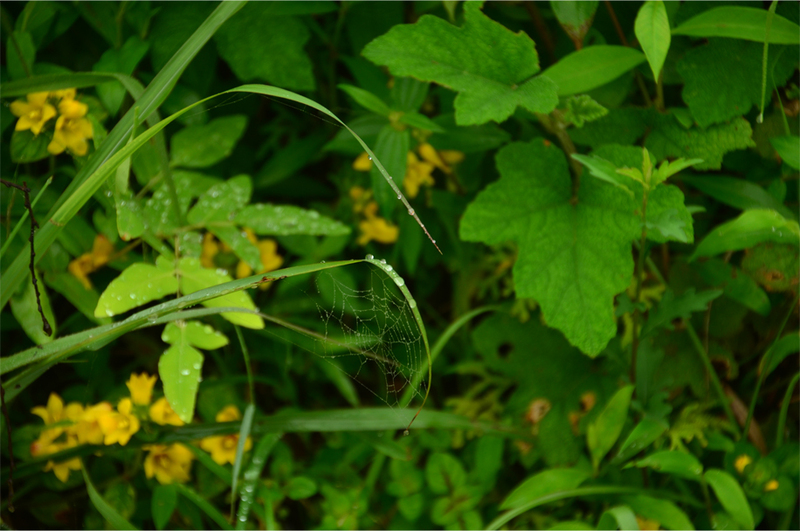 Beautiful pictures, and lovely writing style, Thanks for sharing! Thank you Chana! Someday you will be travelling for sure… and maybe even blogging about it! You must visit the Philippines. 🙂 Palawan, Bohol, Cebu, Vigan, Siargo Island, Davao, Dumaguete, Baguio, and Boracay are the places to be. Indeed, Kerry – looking at this now I don’t think the photos quite do it justice! I pressed you on my blog. This hike makes my Italian adventure look very tame. Beautiful pictures! My wife travels to China on business and wants me to meet her on one of her trips. Reading your article and seeing your pictures makes me want to do it sooner than later! Thanks for sharing! You’ll have to join her on her next trip – there is so much to see aside from the main cities! About three years ago I was staying in a hospital room with my mother while she recuperated from surgery and there was a travel special on TV about the rice paddies. I was totally captivated and thought that I wanted to travel to China and experience it for myself. Your blog post reminded me. I still need to go. China is often intense – even with a workable grasp of the language I always find myself reeling from culture shock whenever I visit. It’s one of those countries that most travellers either love or hate! But so far it has really had a knack for yielding some of my most memorable travel experiences. Really like the title of your blog by the way, I’ll have to have a read through your posts! Amazing view! I wish I could visit the place.. Spectacular. 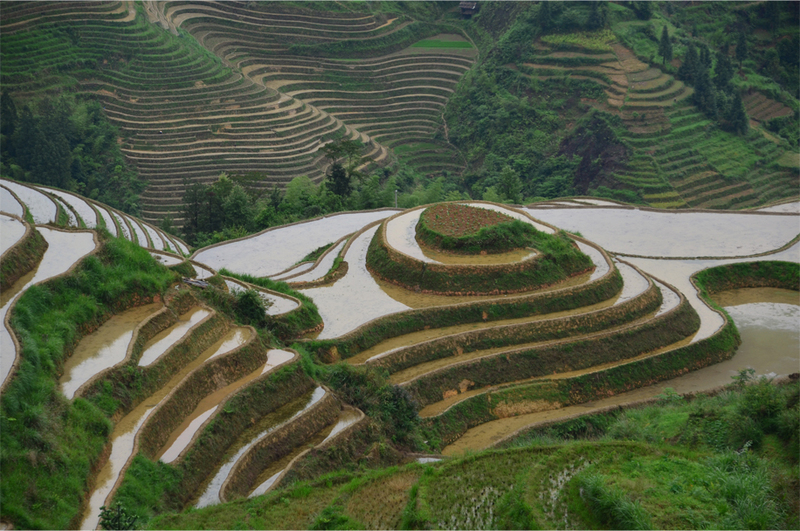 We have the Ifugao Rice Terraces here in the Philippines but sadly they are not properly conserved and preserved. I’ve heard that they’ve recently been taken off the list of World Heritage Sites in danger, so that’s a good sign. You should to go to the one in Banaue Philippines. It’s like this, but in steroids! It’s freakin’ ginormous! I would love to see those terraces at Banaue and Batad! It’s been on my wishlist ever since I played “Where in the World is Carmen Sandiego” as a child. That will have to be a definite stop on a future trip to the Philippines. James, it may have taken you a while to write your post, but it’s absolutely gorgeous – the stunning photographs, and the intimacy of the inn where you waited out the fog. I have to say the “Citadels’ photograph was my favourite, despite the wonderful view of the terraces when the fog lifted … Great post, and congratulations on being Freshly Pressed – a most deserving recommendation. Thank you Meredith, for such wonderful words. It was real struggle at first – trying to put that entire experience into writing. For a long time the notes I took sat virtually untouched, then I modified it bit by bit before wrestling with the text for another two weeks. One afternoon it all just came together like clockwork. I too love that photograph as it almost suggests an Incan hilltop ruin, and it tells of the peace and isolation we felt as we sat inside that guesthouse above the clouds. The photographs are beautiful, the story is full of life and details. One of the best hings I have read here! Thanks Denise, I’m glad you enjoyed it! Wow your photos are amazing! I like how you tell your stories. Would love to see more posts like this one! I really recommend it, Jesse! Amazing pictures. Congratulations on being freshly pressed. You’re more than welcome – thanks for dropping by! Oh, beautiful, beautiful post James! Your evocative prose complementing the gorgeous photos. The misty Citadel IS the star 🙂 The introduction of modern cable cars and elevators would be a tragic intrusion into this idyllic place. Thanks so much, Madhu! 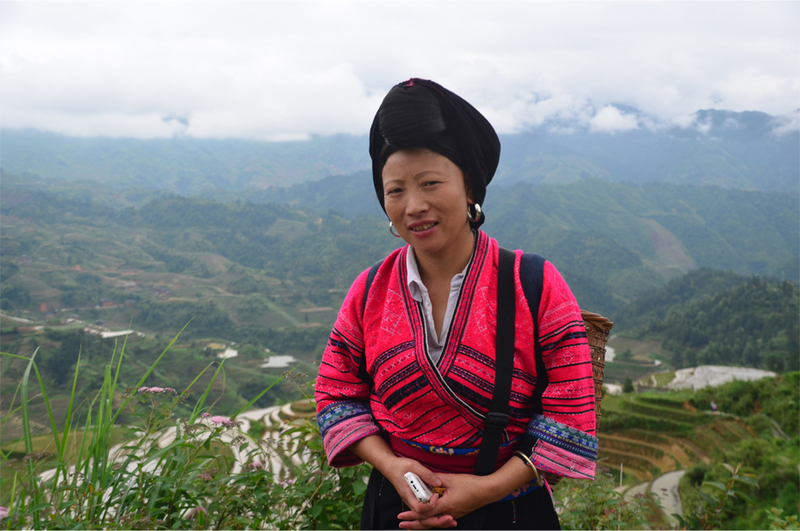 It was very humbling to meet the women of the Yao tribe – without them this would not have been the same story at all. Funny thing is, when I took that photo of the ‘Citadel’ your posts on Machu Picchu came straight to mind! Flattered James 🙂 Your pictures are way better! Pics of mountains among the mist is beautiful sight.